I have a confession to make. 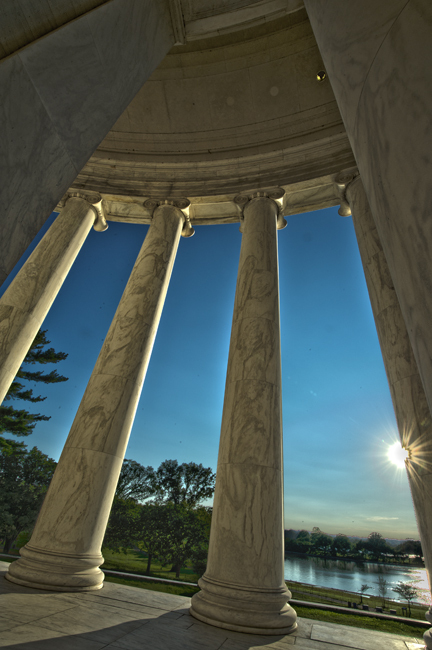 I’ve lived in the Washington, D.C., metro area for more than 30 years, and I’ve only been to the Jefferson Memorial once. Tonight I made my second visit. It’s really a shame that I live within about an hour’s drive (without traffic) to our nation’s capital, and I rarely go down unless it’s work related. I spent about five hours down on the Mall today visiting a few select monuments with a small group of fellow photographers. We began at the Tidal Pool boat house, walked to the Jefferson Memorial, Roosevelt Memorial, JFK Memorial and finished at the National World War II Memorial. The meeting was a wonderful excuse to make the trek downtown, and I enjoyed rekindling my memories of the great people who have built and supported this wonderful country. Photographically speaking, I concentrated my efforts on HDR (high dynamic range) imaging, which is a process that uses a wider range lights and darks to more accurately represent the range of intensity levels found in real scenes and in the human eye. For this image, I took three consecutive photos of this scene, varying the exposures to emphasize the lights, darks and the ideal. Using Photoshop, the images are combined and edited, and the resulting photo has greater detail and impact. There’s really no way to portray on a screen how impressive and inspiring these monuments are when you’re standing there in person, but I hope that some of my photos will reveal a glimpse of their beauty. Thanks for the explanation of HDR. I wasn’t really sure how that worked. This shot is just beautiful. Beautiful results! I just moved away from the metro-DC area, and I will miss the vibrancy, history, beauty of the District. A very photogenic city, and you did a superb job with this shot! This is really a beautiful photograph. You cease to amaze me! !